I have a book on my shelf that I take down a couple of times each year. The book was written by a young man that I first came to know while serving at Lynchburg Christian Academy. 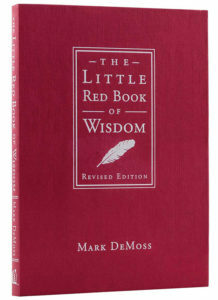 The book’s title is The Little Red Book of Wisdom. This small book as several short chapters that provide Christians will some keys on how to obtain true wisdom. Mark learned these nuggets of wisdom from his father and others who God used to influence his life. Over the years I have gleaned many things from this book that have shaped my life as a husband, father and leader. Recently, I opened this resource to read a couple of the chapters that dealt with “Wisdom for Your Personal Life”. The one chapter that caught my attention was The Wisdom of Firsts. Everyone wants to be first in whatever he/she attempts to accomplish. But this writing is not about how to be #1 but what to keep #1 in your life. As many of us who are involved in Christian education are entering into the summer months, I thought I would share with you three simple acts that will bring God’s blessing on your life. We all want God to bless us and have His hand of favor on all we do. However, sometimes we fall short of experiencing this in our everyday lives. The Wisdom of Firsts can be summed up this way: The First Hour, The First Day, The First Dime! One of the things every Christian must do in order to have God’s presence in his life is to give God the first hour of every day! There is something that happens when I start every morning spending time with the Lord. When I open God’s Word and let Him speak to me, it changes my perspective on what I am facing at that particular time. It also prepares me for what God has in store for my life that day — many times it’s things that I don’t even know are going to take place. Each year I try to find a plan by which I can read the Bible through in that year. This year I am following a plan that I found on the website for John Piper’s ministry, Desiring God. This plan has me reading portions of the Old and New Testament each day. Even though I have read the Bible through many times, this year I am finding myself underlining more and more passages that the words seem to almost jump off the pages. After reading God’s Word each morning, it is also important for me to talk to God. An early morning prayer time has proven to be so special to me as it helps me stay focused on Him throughout the day. It is during this time of prayer that God brings to my mind others who need God’s touch on their lives. Whenever this happens, it makes me realize that my problems are quite small as I think of others who are facing much more serious challenges in their lives. I travel a lot in my ministry and most trips I schedule start pretty early in the morning. Because of this I must discipline myself to set the alarm a little earlier. If I don’t do this, I end up rushing to the airport and, before you know it, I am deep into my day’s work without getting any wisdom from the Lord that He knew I needed to accomplish what He wanted me to do that day. 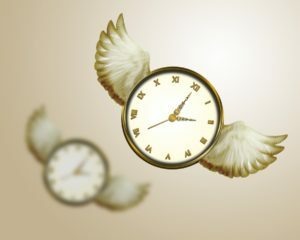 So, if you want God’s blessing in your life give God the first hour of every day! A lot of Christians that I know are very faithful in giving God the first hour in every day. However, this second Wisdom of Firsts is one that many of us, especially those of us in full-time ministry, struggle with. 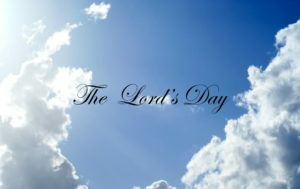 It is also important to give God the first day of every week. I know that you might be thinking that you do that. You may be one who never misses a Sunday going to church. In fact, you may even use your gifts on Sunday in service at your church. However, I am not talking about giving God the first morning of every week. In our fast paced lives, we can get to the point when we think that we can’t afford to cease form all of our work for a whole day. I have come to enjoy the music ministry of Andrew Peterson. He has written a series of songs that he put into a couple of albums called Resurrection Letters. One of his songs is simply called, God Rested. In it Peterson reminds the listener that six days God worked and created the world and all that is in but on the seventh day — God Rested! When you read the Scriptures, you don’t find that He rested for a morning or for an hour but for a day. I cannot tell you how many times I have gone to church and immediately after the services, I have rushed out into to life to do stuff that just “had to be done”. One of the things that I have come to realize is that it is very easy to forget everything God wanted to teach you in a church service when you end up racing to your “next important task.” I think this is what Jesus had in mind when He was teaching His disciples about sowing seed into different types of soil. I have experienced this happening in my life when I failed to give God the first day of every week! Have you ever gone into a restaurant or business that was individually or family owned? These types of business are many times quaint establishments that have various things on the walls or shelves that are reminders of how the business started and grew over the years. One of the items I have seen on walls of private businesses many times is a small picture frame with a dollar bill encased inside. 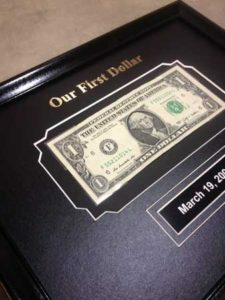 It represented the “first” dollar that the original owner made in the business. Well, God establishes His private businesses throughout the world in the lives of His children. He calls us to do His will, equips us to do it and then sends us out to perform it for His glory. This is called “work”. Through our work we receive increase or pay. Of course, we know that everything we have comes from God and that God owns it all — or so we say we believe this. However, the third act we find in God’s Wisdom of First may be the one that is violated the most. It is simply the act of giving God the first dime of every dollar. The tithe is not ours to give to God but it belongs to God and we simply acknowledge that the first dime of all our increase is His by giving it back to its rightful owner. I have talked with Christians and they have argued that it is the first dime of every “net” dollar or after taxes that one earns. If that were the case, then it wouldn’t be a “first”. There is not time to go into this in this blog but I encourage you to read Haggai 1:1-11 and see how God views it when we don’t keep this “first” in our lives. We are to give God the first dime of every dollar! Three simple acts with major consequences that we will experience if we faithfully perform them. However, there are equal but opposite consequences in not doing them. As you go through the summer months, I challenge you to begin the habit of the Wisdom of Firsts by giving God the first hour, day and dime. Have a blessed summer!